In nearly fifty years of broadcasting Sir Michael Parkinson has interviewed more than 2,000 of the world’s most famous names. His legendary talk show 'Parkinson' spanned four decades and became one of the nation’s favourite TV programmes of all time. Now, for the first time, Michael Parkinson records the highlights of his interviews, reflecting on 100 memorable guests and the moments that made TV history. Thanks to the good people at Hodder & Stoughton, we have a copy of Michael Parkinson’s new book 'Parky’s People' as well as the forthcoming BBC DVD, 'The Michael Parkinson Collection'. From Henry Kissinger to Tony Blair, Jack Lemmon to Will Smith, and Madonna to Elton John, 'Parky’s People' contains a fascinating collection of interviews from five decades of a remarkable career. 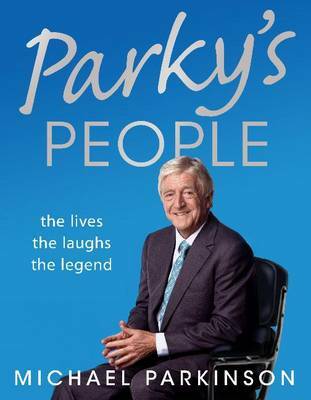 'Parky’s People' is a tribute not only to Michael Parkinson’s personal heroes, but also the greatest characters, moments, thoughts and entertainment trends of the 20th century. The 'Michael Parkinson Collection' is a definitive 2 DVD disc collection which includes interviews with celebrated sportsmen from Muhammad Ali to David Beckham, actors Steve Martin, Meg Ryan and Hugh Jackman. Extras include a special feature called 'Parky Performs' with footage from former guest Stephen Fry and producer John Fisher plus Oliver Reed, Bruce Forsythe, Bing Crosby and many, many more. HOW TO WIN: In the contact form below, answer the following question....What was the name of Michael Parkinson’s legendary talk show? Please put Parkinson Competition in the subject and your answer in the message box. The form will let you know if your entry has been successfully sent. Let me know if there are any issues by leaving a comment. 'Parky’s People' was released on October 14th by Hodder & Stoughton, to be followed by the DVD collection on November 22nd.